The West Wing, Aaron Sorkin’s long-running series about a fictional Democratic presidency, began with an executive branch in crisis. It was a pretty stupid crisis. Josh Lyman, the deputy chief of staff, had insulted a Christian Right activist in a TV debate. The activist wanted an apology. She mounted up her staff, the White House deployed its communications team, and the situation careened into crisis until the president, played by Martin Sheen, arrived and smote the threat with Biblical wisdom. Literally. He walked into the dicussion, quoted from the good book, and made everyone look stupid. I mention this episode – 13 years old now! – because Armando Ianucci’s Veep is not actually a revolutionary show about politics. Even the most self-serious political show of all time (we’re not counting The Lyon’s Den) was, from episode to episode, mostly about the bumblings and flirtations of top staffers. But each episode’s third act got around to proving the essential goodness and wisdom of the president and his lieutenants. Veep never gets there. Its closest ancestor is the BBC’s series Yes, Minister (and Yes, Prime Minister – sorry, spoiler), in which an almost-bright-enough politician navigated the permanent government and sort of succeeded. Vice President Selina Meyer, played by Julia Louis-Dreyfus, is also almost-bright-enough, and she almost succeeds. She ran for president in the primaries, lost, but did well enough to be a credible running mate for… whoever the president is. He’s never named. “You spent too much time in New Hampshire,” explains a senatorial aide named Dan Egan, who offers the advice without prompting. “You shouldn’t have gone negative in Oregon.” Meyer is not really a stand-in for Sarah Palin, even though judging by the number of “zero” ratings on IMDB for an unaired show, I can guess that Republicans think she is. She’s an amalgam of Hillary Clinton and Yes, Minister’s Jim Hacker. Nobody doubts that Hillary Clinton is smart, but there were moments in her 2008 campaign when she made disastrous gaffes. Was she temporarily stupid? No. Politics, and coverage of politics, temporarily makes morons out of its practioners. 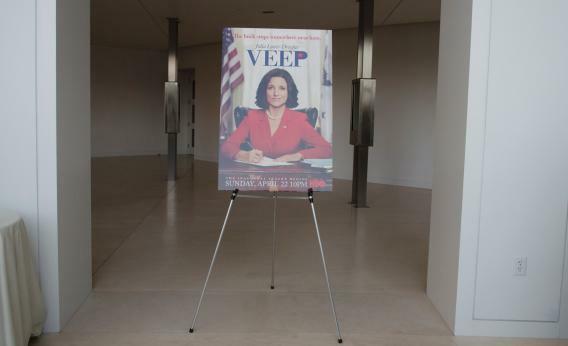 Nobody in Veep is truly stupid. Ianucci’s scarily accurate Washington is populated by sharp nerds who have made the choice to settle or to climb. “Look at you, then look at me,” says Egan to Meyer’s actual press chief, Mike McClintock. “Ask yourself: Next year, will I be working for you, or you be working under me?” McClintock, who’s given telltale sad-sack character traits like a dog, sheepishly agrees, hires Egan, then gets a lick in anyway. “We’re going to write a press release. Did they teach you how to do that in your political science class?” Nobody’s achieving what they think they deserve. They try anyway. They are regularly shown up by the White House’s liason, Jonah, whom humiliatingly lords his power over people up to twice his age. I don’t know how this stuff will come off to people who aren’t obsessed with politics. Without the hope and optimism, it probably doesn’t have the mass appeal of The West Wing. But it’s truer than that show, and genuinely funny, with an F-bomb every 60 seconds.